The Hawaiian word wai denotes something valued or treasured, true wealth. This program explores the concepts of aloha ‘āina (love for the land), kōkua (helpfulness), ‘ohana (family), and “thinking island." Lani Kapuni, Lilia Hale, Clyde Aikau, Nainoa Thompson, Eric Enos, Sam Ka‘ai, John Dominis Holt, Marion Kelly, Violet Hughes and Keoki Fukumitsu. 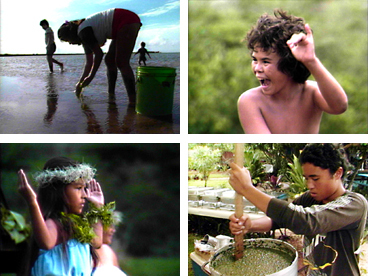 Originally produced for the school children of Hawai‘i.